We open at 3:00 pm US Central Time on the first day of a new catalog. After that, our regular hours are 9 am to 5 pm US Central Time. AVAILABILITY: All items are available on a first-come, first-served basis. All of our new ‘catalog grade’ items go directly to the catalog and are not available for anyone else to purchase before the catalog opens. Even the owners and staff at AGM must wait for the catalog to open, just like everybody else. We can’t guarantee you will get the item you want, but we can absolutely guarantee that you have the same chance at it that everyone else does. This policy is a cornerstone of our business. CONDITION: We sell items used by soldiers who were participants in historic events. Mint or unissued items will be noted as such, all others will show expected normal service wear. Items are compared with like items of the same age and construction for our condition notations: I = Excellent, II = Very Good, III = Fair. GUARANTEED ORIGINAL: Items are 100% guaranteed to be as described for identification and originality. If we make a mistake, you are covered, no matter when the purchase was made. ORDERING: The fastest and easiest way to order is to use the website. However, you can also call in an order by telephone at 800-AEF-1918, or 573-243-1785. IMPORTANT: If you are reserving items for yourself using the website, please note that buying an item removes it from the sale and reserves it exclusively for you. Do not reserve items that you do not fully intend to purchase. It is unfair to your fellow collectors, and to AGM. If items are purchased and the customer later wishes to keep some and release others, the ENTIRE ORDER is released, and the customer will permanently loose his ability to place online orders in the future. Ordered items are reserved for you for ten days. Payment in full or a 30% lay-away deposit on approved lay-aways must be received within 10 days, or the item will become available to other buyers. OFFICE HOURS: Our business hours are 9:00 a.m. to 5:00 p.m. (U.S. Central Time). After the first week or so of a catalog, we can be away from the phones quite a bit (wrapping orders, making trips to the post office, etc. ), so the best way to communicate is almost always by email - especially if you wish to speak with the owner (me) personally. I spend most of my time on the road going to shows, on buying trips, etc. Yes - far more time in the truck than in the office. Messages left on the machine may not be noticed right away, so if you can, email is the best option. We will get back to you as quickly as possible. 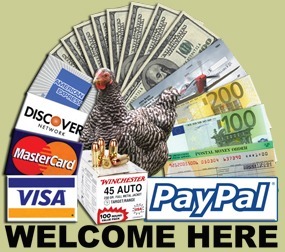 PAYMENT: We accept Personal Checks, Money Orders, PayPal, Visa, MasterCard, American Express, and Discover Cards. Credit cards are accepted at no additional charge to you. Credit card charges may appear on your bill as "Museum Resources International." or "Advance Guard Militaria" depending on which account is used. Please make checks or money orders payable to "Museum Resources." If you are registered on our site, payment is easy using our online invoices. If you are not registered, or do not want to use the online invoice, you can also make PayPal payments directly to: payments@advanceguardmilitaria.com. SHIPPING: See chart below for shipping and insurance rates. ‘Feather Rate’ is for very small / light items (insignia, etc. ), and ‘Anvil Rate’ is for heavy / awkward / fragile items. We ship most items by UPS, feather rate items by US Postal Service. For normal size items we very much prefer UPS - if you can provide a street address rather than a PO Box, we really appreciate it. We begin shipping orders as soon as possible but there are always many orders to process - PLEASE ALLOW TWO TO THREE WEEKS FOR DELIVERY. INSURANCE: See the shipping chart above. Because most folks like to keep their shipping cost as low as possible, we do not require insurance. Insurance is optional (completely your choice), but be aware that the buyer agrees to assume all risks for uninsured packages. To clarify: if a package goes missing and you purchased insurance, then it was insured and you are covered. If a package goes missing and you did not purchase insurance, you are not covered. Could you skip the insurance and then reclaim the entire amount of your invoice through PayPal or a Credit Card chargeback? Well.. yes. It would be a sneaky, dastardly thing to do, but honestly we could not prevent you from doing this. Fortunately, our customers are more honorable than that. If someone did choose to take such action, though, it would certainly be their final interaction with us. RETURNS: Though we try very hard to avoid it, we make mistakes just like everyone else. If an item is not as described, you are covered. We request that you call and obtain a return authorization number, though, because often a question about an item can be easily answered or any confilcting information resolved. Unauthorized returns are not accepted. Also, we do not ever guarantee original pre-1946 uniforms, hats, and equipment to fit. If you are into wearing the stuff, hey.. everybody has their fetish, I guess. However, whether an item fits is none of our concern and we will not accept returns for reason of size (or durability). Any alteration, cleaning, oiling, or other tampering with an item voids all return privileges. Refunds are for the original purchase price only. Inappropriate returns (i.e. I discovered I already had one, my wife is mad at me, etc.) may be accepted solely at our discretion for store credit only, with an appropriate restocking fee. Your trust and happiness is EXTREMELY important to us. If we have erred, we will do whatever it takes to remedy the issue. PERSONAL DELIVERIES: We occasionally make show deliveries of items that are too large, bulky or fragile to be delivered by conventional means. (cannons, aircraft propellers, glass display cases, etc.) All other orders MUST be shipped from our warehouse. This is to ensure that all of our customers receive their orders in a timely and efficient manner; and to ensure the maintenance of our sanity while trying to leave on time for a show. Sorry guys, no more show deliveries of ANYTHING. I don’t care if it IS a cannon. We’ll slap a label on it and ship it. All orders must be paid for through normal channels and shipped. The Show deliveries and the nonsense surrounding them are a headache that we have officially eliminated as of March 2009. Absolutely no exceptions whatsoever. *Customers are limited to one lay-away invoice at a time. Your first lay-away invoice must be paid in full before you can start a new one. *The deposit is due in the normal 10-day payment window. If no deposit is received in 10 days, the item is not on lay-away and is sold to the next customer who asked for it. *Lay-away orders carry no return or exchange privilege This of course does not apply to returns for reasons of authenticity. Items are always guaranteed to be original and correctly identified. *Delinquent accounts are subject to forfeit of payments made. PHOTOS & DESCRIPTIONS: Remain the intellectual poperty of AGM. Our photos and descriptions may not be reproduced elsewhere without specific permission. However, copies for your records are available for registered users via the USER CP page. These typically remain up and available to you throughout the life of a catalog. Once the new catalog goes up, though, the older items drop off this page.